This report is a result of extensive discussions within Task 56 of the Solar Heating and Cooling Programme (SHC) of the International Energy Agency (IEA). Innovative solar envelope technologies face multiple barriers, which prevent some of these innovations from contributing significantly against climate change. This report presents the barriers that the experts of Task 56 are aware of. 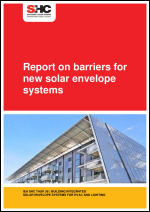 The aim is to provide a comprehensive view (as much as possible) that developers of new integrated solar envelope systems could benefit of, at an early stage of their planning phase.